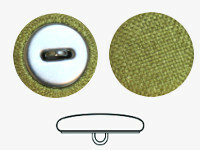 Metal shank buttons are used both in upholstery (usually in quilted furniture or other quilted elements) and the clothing industry. The buttons are made of aluminium cups and metal caps with ears. We cover the buttons with thick fabric, such as: felt, plush, codura, flock, microfibre, pelt, jacquard; we do not produce leather buttons.